It is because of her dislike of such news personalities that I really didn’t watch them growing up, and I didn’t start watching them once I became an adult. I’ve never made it through an entire episode of Kelly File, Hannity, nor the O’Reilly Factor. I haven’t even watched an entire news program in over 4 years, and if there’s a segment I want to see, I wait until the clip hits YouTube. It’s my way of controlling the narratives that flourish in a media filled environment, and how they mold my opinions. I think Fox News is just as bad as the rest, and I’ve watched more Daily Show in the last three years than I’ve watched of the right leaning network, but my convictions and conservative beliefs remained intact. The truth is that the right leaning love child of Jon Stewart and Stephen Colbert would be my spirit animal. To the point: My anti-political Mother did more to teach me about politics than most political leaders. No matter what program I watched, or who I related to the most, what they said didn’t have to align with what I believed, and conforming to their opinions without research was out of the question. It was my job to go beyond their one-liners to find the truth. She’s always leaned conservative, but she’s always hated conservative pundits and talking heads. I guess that’s why I find it easy to say I disagree with them. Put more stock into what you believe than what they believe, and don’t let them sway your beliefs – that’s the ultimate goal. This is why I read my news online – for the most part – from various sources. I make sure that the words match actions. That’s why I can watch Jon Stewart and Stephen Colbert and say, “well, that was a dumb statement,” and on another topic say, “wait, I agree with that!” It’s also why I can hear, “Ted Cruz is the perfect choice!” from every high profile “conservative” news personality, and also know it’s rubbish. She also taught me that drinking cake batter out of a mug every once in a while can make bad days tolerable. Well, guys, Ted Cruz isn’t all he’s cracked up to be. Now, you may make the choice to stop reading, or you can hear me out and then interact and tell me why you disagree with my assessment, or where I’m wrong. Don’t worry, I won’t call you a “lying liar who lies.” Having our opinions challenged is healthy! If you can’t build a strong defense of your stance, go back to the drawing board. If you’re scared of opposing opinions, it’s probably for good reason. I love politics, I like to talk politics, I like to study politics, I like to debate politics, but I eschew those who have no interest in a conversation and merely wish to stab their pitchforks into the throat of anything that doesn’t involve groupthink simply because they don’t like opposition. Ted Cruz is the Emperor of the Groupthink Utopia, and he knows it. The subtlety of his manipulation is staggering in that people are completely blind to it. As mild as that seems, Ted Cruz knew exactly what he was doing there. He knows, for a fact, that Rubio is not “moderate,” but the term is a buzzword for the heretic hunters. He’s well aware that the purity pursuers are waiting in the shadows. “We have found a witch! Suddenly they’re throwing Marco Rubio on a scale to see if he’s heavier than a duck, and they all do the equivalent of screaming “burn him, burn him!” In the end they all look like morons measuring the weight of Marco Rubio to a duck, but that damage will be done. Meanwhile, Ted Cruz remains above reproach for simply making an innocent little comment. Then he plays nice with the only “Republican” truly advocating for big government, even going so far as to applaud his inclusion in the race. Once again, his admirers scream, “He’s just trying to get along with everyone!” And just like that, he gathers the gross underbelly of the conservative movement to do his bidding without even putting in an official request or writing a check. *Raises hand* Say, I don’t want to cause a kerfuffle here, but wouldn’t a man of principle be honest with voters about conservative positions, candidates, and logical options? And wouldn’t a true seeker of a principled candidate look for someone with, say, I don’t know… principles? Yes, it is that silly. Yes, this new brand of politics is a trend. I highly recommend reading this article. It does a superb job of pointing out that Reagan himself appointed moderate Republicans like Richard Schweiker and Margaret Heckler, while moderates like Silvio Conte, Jim Leach, Mark Hatfield, Bob Packwood, etc., were House members, and they got a lot accomplished by coming to agreements. George Will did come up against those militantly fighting against GOP members, and at the time I thought he was wrong, now I wonder if he knew where it would lead. The author of the above noted article also notes what he believes it means to be a conservative, which is a much needed reminder today. I believe that to be a conservative is to be for limited government. Personal freedom. The rule of law. The Constitution, and adherence to it. Federalism. Equality under the law. Equality of opportunity. Relatively light taxation. Relatively light regulation. Free enterprise. Property rights. Free trade. Civil society. The right to work. A strong defense. National security. National sovereignty. Human rights. A sound, non-flaky educational curriculum. School choice. A sensible stewardship over the land, as opposed to extreme environmentalism. Pluralism. Colorblindness. Toleration. E pluribus unum. Patriotism. Our Judeo-Christian heritage. Western civilization. Now, it could be that I have simply declared what I believe in and called it “conservatism.” And I have no doubt that I’ve forgotten a few important things, as my critics on the right will no doubt tell me. A conservative like me is everything these frustrated, angry, outraged, selective puritans hate. I support small government, which means I’m against anything leaning towards overreach – including no-knock raids, civil asset forfeiture, and a military-esque police force. I support candidates like Paul Ryan, because he realizes that to get things done we need to work together, to a degree. I have liberal friends, and I hear them out and take the time to explain my position. I research the facts behind their blessed, anointed candidates, and I declare them unfit for the monuments their faithful and determined followers erect in their name. I do my own research and find their labels laughable, at best. I can’t stand fear mongering, trendy politics, and canned answers. The list goes on, and on, and on. But above all, I don’t worship Ted Cruz simply because he tweeted out the Bill of Rights, made Machine Gun Bacon, or enjoys being disliked by people like me. Ted Cruz gains his support not by things he’s accomplished, but because he constantly says he’s proud to stand in defiance against those he thinks simply object to a true patriot. Those his followers assume object to a conservative loving, gun rights advocating, freedom preaching, honesty oriented, individual rights advocating, Reaganite patriot like him. Wait, maybe he’s right… let’s take our country back! Because that’s how true patriots roll in America, land of the free! And God Bless America, and God Bless all her people! And before you know it, he hits the patriotic nerve. I love my country just as much as you do, Ted supporters, but I’m not prone to emotional highs from speeches specifically designed to cause emotional highs. His patriotic words will never blind me to his inconsistencies, and while I can acknowledge when he’s right, I’m also not willing to play his game. Is it “moderate” to be 100% pro-gun? Is it moderate to be 100% Pro-Life? What about being an advocate for personal freedoms? What about standing for national sovereignty and security? What about wanting to secure the border? What about wanting logical immigration reform? What about supporting Kate’s Law? Oh, so those aren’t moderate positions? Wait, wait, I know what you’re thinking, Ted… Marco supports an increase in H-1B visas, and while it’s highly misunderstood and blown out of proportion by people like yourself – including the fact that your followers always forget to add his belief that the abuse of the system must be corrected first – maybe you have a point. Especially with short attention span voters. And, let’s be honest here, Ted, we’re not in the mood to accept changes to anyone’s opinions, unless they’re named “Trump.” The fact that Marco walked away from the Gang of Eight because they weren’t interested in ending sanctuary cities, nor securing the border to his standards, is irrelevant. I mean, ANY support of H-1B visas, and any willingness to work with the Go8 should absolutely bury Rubio, and forever label him a moderate. Right, Ted? WASHINGTON, DC – U.S. Senator Ted Cruz (R-TX) today presented an amendment to the Gang of Eight immigration bill that would improve our nation’s legal immigration system by increasing high-skilled temporary worker visas, called H-1B visas, by 500 percent. Final questions: Is it conservative to refuse to work with others, to banish reaching across the aisle? Is it conservative to support an oligarchy-esque set of ideals where some representatives are silenced by a minority of people who play “my way or high way” games? 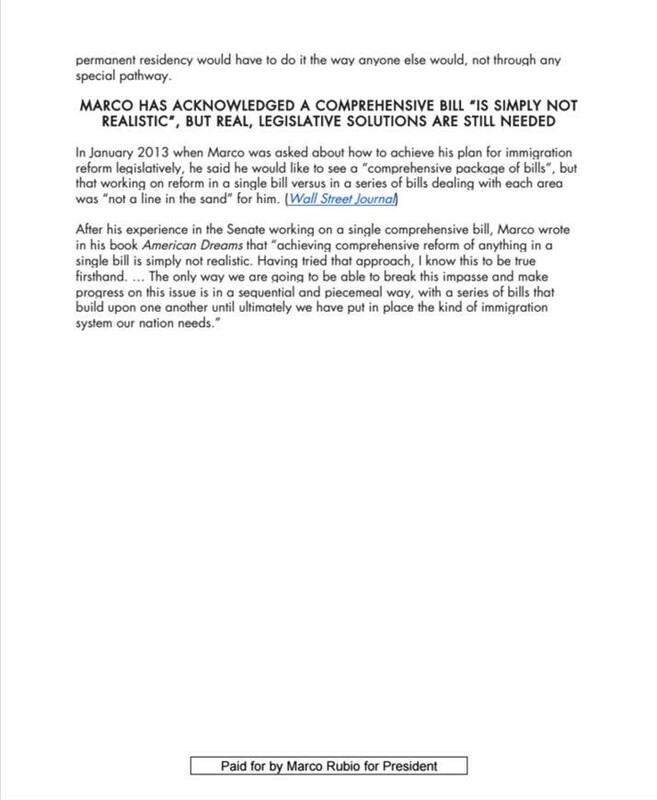 Take your time answering… I’ll be over here campaigning for Marco Rubio, a man who is more conservative than Ronald Reagan, a man who offers logical reforms, not just goosebumps and mic drops. A conservative that, quite frankly, puts your so called “principles” to shame. 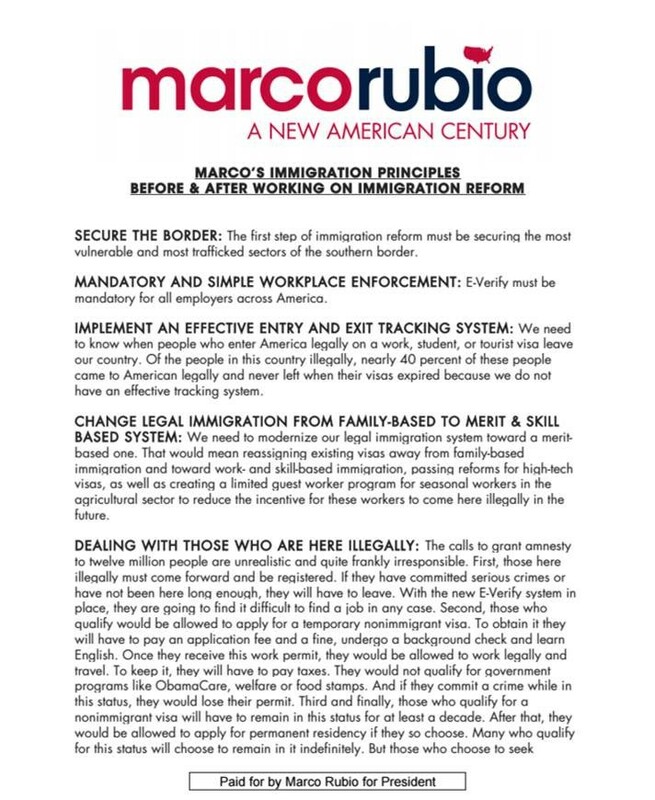 UPDATE: I wanted to include Rubio’s immigration plan in this post, as well as previous Cruz remarks on illegal immigrants. Now, Cruz has been trying to separate himself from Rubio by framing the narrative to look like Rubio supports amnesty, when the above clearly shows this to be a falsehood. However, how did Cruz feel about those already in the country back in 2013? Hmmm… So, you mean, something like allowing them to apply for a temporary non-immigrant visa? See, the truth of the matter is that Cruz’s immigration stance, at least until he saw the crowds migrating towards Trump, is almost identical to Marco’s stance. Your snark is a thing of beauty. Not a Cruz Fan For The Same Reasons. Interesting take although I think that if you replace every mention of Ted Cruz with Donald Trump it would be more accurate. When you say that Cruz characterized Rubio as a moderate I think it is inaccurate. I would say that Rubio is establishment, yet getting ahead of the line against establishment wishes, with eventual reluctant establishment support. In the end I see that Rubio or Cruz will be acceptable to me with Carson a distant 3rd. LOVE this. My comment will be short because I need to go back and re-read your post. It is deliciously on point.